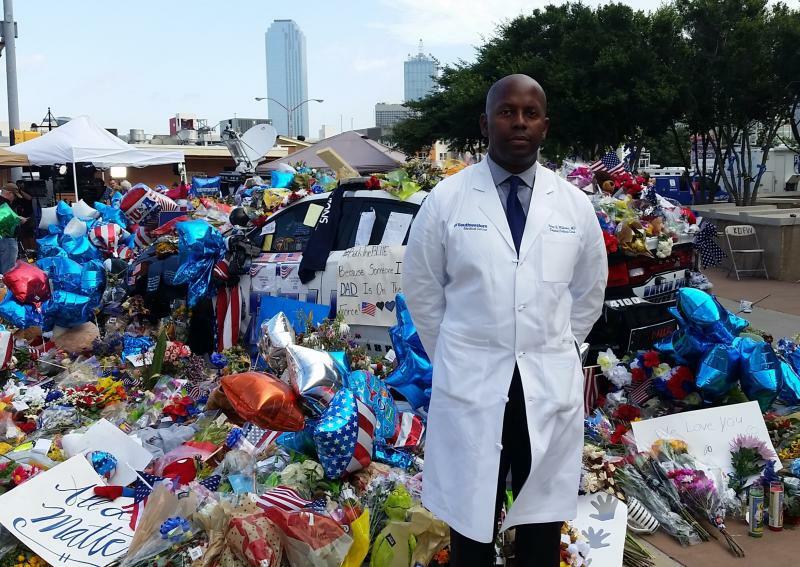 Dr. Brian Williams was one of the trauma surgeons treating wounded officers on July 7, 2016. His emotional statement at a later press conference went viral. The nation came to know Dr. Brian Williams in the days after July 7, 2016. He was working at Parkland Hospital that night when wounded police officers were brought into his operating room. The trauma surgeon treated three of the five officers who eventually died from their gunshot wounds. He spoke four days later at a press conference a few days later, which went viral. More than a year after what he calls "a turning point" in his life, Dr. Williams has left that job, without another one lined up. An extended Friday Conversation with Dr. Brian Williams. For me, I always felt that there was a lot more facets to my identity as a medical professional beyond my role as a trauma surgeon. What I wanted to do was fashion a career where I could focus on the reasons I got into medicine in the first place. I was interested in having a career that was focused on social justice, which to me meant I could treat patients that had limited or no access to health care. This particular night when you have the peaceful protest in downtown Dallas, which is protesting police brutality, you have a black sniper who is targeting white police officers, and then seven come to our hospital; three are fatally wounded. And then there’s me personally. I was the only black trauma surgeon in that group of 12 and I’m working this night when this happens. This was preceded by the death of Philando Castile in Minnesota the day prior and Alton Sterling the day prior to that. So I was already thinking about these larger societal issues of race and violence, and then they all intersected that night unexpectedly with my professional life. And after that, it was impossible for me to ignore how deeply impacted I was by all this that was happening. One of the most recent occurred here in Dallas, where I was standing outside of my apartment complex, and Dallas police came up to me, essentially questioning me. They were cordial and professional. This is not a story about police brutality. It’s a story about me as a black man fearing for my safety when police approach me, and that happened because someone saw me and thought I looked suspicious, so they called it in and therefore the police responded. I’ve been pulled over in the past. I felt it went beyond what was necessary to get their answers for why I ran a red light or [was] speeding. Minor infractions, but I felt the response exceeded what was necessary in that situation. The reality is you never know if it’s them just doing their job or is it because I am black. It’s a question minorities are always wrestling with in these types of situations. I was completely unprepared for the response. I’m someone that [has] very rigorously protected my privacy and avoided media requests and the spotlight. And when that happened, that was beyond anything I’d expected. I maintained my authenticity about how I felt, describing my duality as a black man in this country who respects law enforcement, decries violence against law enforcement, but also has an inherent fear of law enforcement. And also being a black professional and navigating two worlds when it comes to my job at work and also the inherent challenges of being a black professional, when you’re in the minority in that situation. I’ve come to peace with my ability to acknowledge [that duality] and speak openly about the challenges of that duality. When you’re a black professional, you don’t move your career forward by being outspoken about the challenges of being a black professional. You understand that to get by, you just avoid those controversial types of discussions. When I went into medical school, I recognized that I was in the minority, but it was nothing unusual. You just know that’s the way life is going to be as you move through your professional ranks. What I did not anticipate was overt and covert challenges that I would encounter in medicine. I’ve been called racial slurs by patients. I’ve had patients request to have another doctor. They didn’t want a black doctor, so they’d request another doctor. I’ve been with my colleagues and we’re being introduced and everybody gets introduced by “This is Dr. X, Dr. Y, Dr. Z” and then they’ll get to me and they say “And this is Brian.” Those are things that you just silently endure to get by. But there’s also many positive incidences I can describe where you encounter patients who will tell you that you’re the first black doctor they’ve had in their entire lives, and you can just see their faces light up and the smiles. Somehow whatever they came to see you for is irrelevant; they’ve had a black doctor and that just makes their day. That’s a source of pride for me and also makes me realize I represent something bigger than myself to a lot of people, and I don’t take that lightly. I think a lot of people are afraid to talk about race. I would not just categorically dismiss white people as a whole, but I think we should just talk about it in terms of black and white because that is a dynamic that is the most divisive in this country; that is one that really has not been addressed. I think we all just need to acknowledge that in America we live in a racialized society. That does not mean everyone has racist intent. And if we can separate those two ideas, then we can move the conversation forward because there is a lot of work to do on so many levels to bring some equity for everyone in this country. When I say equity, I just mean fairness, where everyone has an opportunity to succeed. I’m not talking about making things equal across the board. People want to know that they have a fair shot to achieve the American dream. And right now, with everything being seen through the prism of race, that certainly is not possible. Personally, I am not surprised. Now that it’s getting so much public play, I really feel that this is an opportunity for those that were on the sidelines about this issue to see how destructive this can be. There are a lot of people out there that probably did not have the courage to speak up before that are now finding the courage to do so. So as ugly as that element is, to me, I think that visibility is an opportunity for us to move society in the right direction towards more equality. I’m still in a transition phase right now. 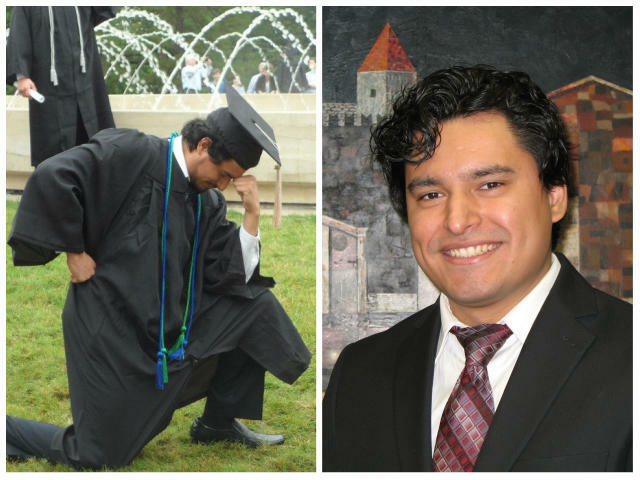 What I do next will encompass having a career that is focused on social justice. The important point I really want to make is I did not quit medicine. I will still be in medicine. I left my former position but not the career of medicine. So it will involve that, but it will maximize other facets of my medical training and experiences beyond my role in the [operating room], which was cutting and sewing. Everything I’ve done up to this point I think is important in preparation for the next phase, and I know that this is the right move, and things are going to turn out OK. 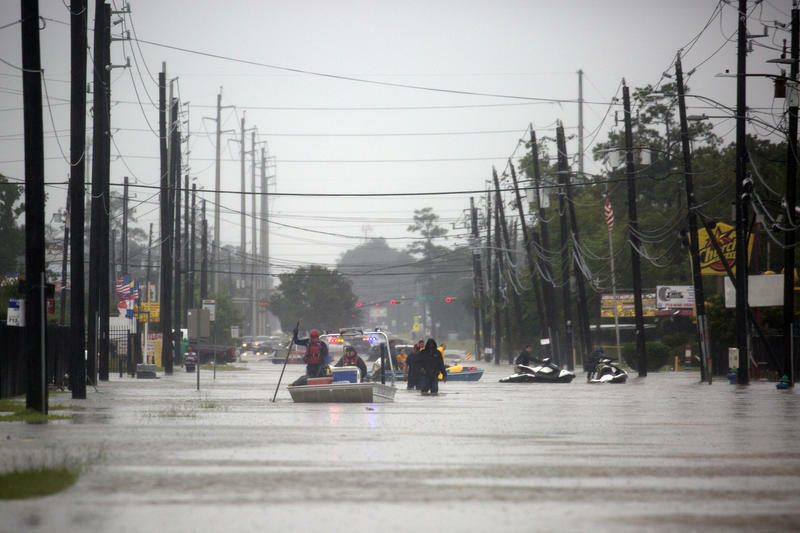 Flood experts, state officials and meteorologists are starting to get the full scope of Hurricane Harvey's behavior and the cost of damage it inflicted on the Texas Coast. After President Trump's decision to wind down the Deferred Action for Childhood Arrivals (DACA) program this week, we've heard voices from big cities like Dallas and Houston. Former NPR journalist Tasneem Raja has been collecting stories of people in Tyler who were brought into the country illegally as children for her news startup, The Tyler Loop. About 700 people spent the night Thursday at the shelter at the Kay Bailey Hutchison Convention Center. Caring for evacuees after a natural disaster presents a huge medical challenge, which Dr. Ray Fowler of UT Southwestern Medical Center knows well.